Introducing my Exclusive Skin named “Celina” only to be sold for 40% off at “The Wild West Fair”, starting August 22nd to September 5th. Celina skin is available in 4 beautiful skin tones (Milky, Sunkiss, Tan, Bronze). Each package includes: 8 Lipsticks options, 2 Eyebrow Options, 1 Freckle option, 1 Beautymark option and 1 Cleavage enhancement option and a Modifiable Shape. 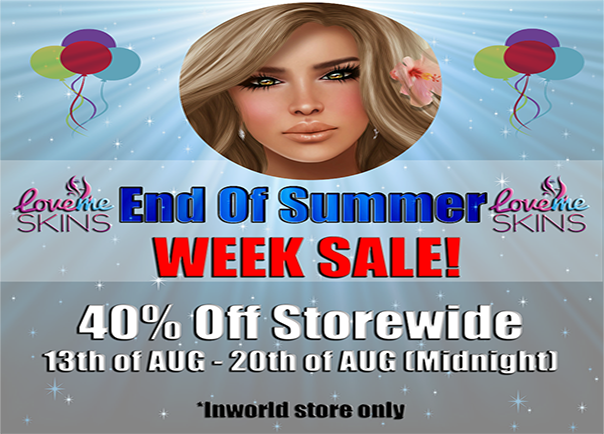 Lolas appliers, lush appliers, slink mesh hands & feet appliers, Phat Azz appliers, Wowmeh Appliers and Slink Physique Appliers are available at the Event. Here is your limousine to the The Wild West Fair. Enjoy! Introducing my Exclusive Skin named “Kenya” only to be sold for 20% off at “The Great Summer Bash”, starting August 10th to August 25th. Kenya is my new “Ethnic Series” from my Silky Collection. Kenya skin is available in 3 beautiful skin tones (Caramel, Espresso, and DK Chocolate). Each package includes: 7 Lipsticks options, 1 Eyebrow Options, 1 Beautymark option, 1 Cleavage enhancement option and a Modifiable Shape. Lolas appliers, lush appliers, slink mesh hands & feet appliers, Phat Azz appliers, Wowmeh Appliers and Slink Physique Appliers are available at the Event. Here is your limousine to the The Great Summer Bash. Enjoy!